Psychologist Elizabeth Loftus has been particularly concerned with how subsequent information can affect an eyewitness’s account of an event. Her main focus has been on the influence of (mis)leading information in terms of both visual imagery and wording of questions in relation to eyewitness testimony. Loftus’ findings seem to indicate that memory for an event that has been witnessed is highly flexible. If someone is exposed to new information during the interval between witnessing the event and recalling it, this new information may have marked effects on what they recall. The original memory can be modified, changed or supplemented. The fact the eyewitness testimony can be unreliable and influenced by leading questions is illustrated by the classic psychology study by Loftus and Palmer (1974) Reconstruction of Automobile Destruction described below. Aim: To test their hypothesis that the language used in eyewitness testimony can alter memory. Thus, they aimed to show that leading questions could distort eyewitness testimony accounts and so have a confabulating effect, as the account would become distorted by cues provided in the question. To test this Loftus and Palmer (1974) asked people to estimate the speed of motor vehicles using different forms of questions. Estimating vehicle speed is something people are generally poor at and so they may be more open to suggestion. Procedure: Forty-five American students formed an opportunity sample. This was a laboratory experiment with five conditions, only one of which was experienced by each participant (an independent measures experimental design). 7 films of traffic accidents, ranging in duration from 5 to 30 seconds, were presented in a random order to each group. Thus, the IV was the wording of the question and the DV was the speed reported by the participants. 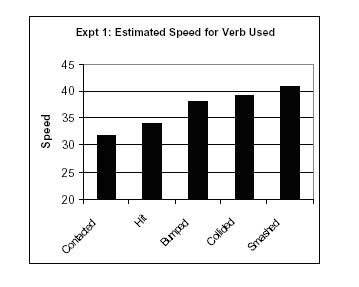 Findings: The estimated speed was affected by the verb used. The verb implied information about the speed, which systematically affected the participants’ memory of the accident. Participants who were asked the “smashed” question thought the cars were going faster than those who were asked the “hit” question. The participants in the “smashed” condition reported the highest speed estimate (40.8 mph), followed by “collided” (39.3 mph), “bumped” (38.1 mph), “hit” (34 mph), and “contacted” (31.8 mph) in descending order. Response-bias factors: The misleading information provided may have simply influenced the answer a person gave (a 'response-bias') but didn't actually lead to a false memory of the event. For example, the different speed estimates occur because because the critical word (e.g. 'smash' or 'hit') influences or biases a person's response. The memory representation is altered: The critical verb changes a person's perception of the accident - some critical words would lead someone to have a perception of the accident being more serious. This perception is then stored in a person's memory of the event. If the second explanation is true we would expect participants to remember other details that are not true. Loftus and Palmer tested this in their second experiment. Procedure: 150 students were shown a one minute film which featured a car driving through the countryside followed by four seconds of a multiple traffic accident. Afterwards the students were questioned about the film. The independent variable was the type of question asked. It was manipulated by asking 50 students 'how fast were the car going when they hit each other? ', another 50 'how fast were the car going when they smashed each other? ', and the remaining 50 participants were not asked a question at all (i.e. the control group). One week later the dependent variable was measured - without seeing the film again they answered ten questions, one of which was a critical one randomly placed in the list: “Did you see any broken glass? Yes or no?" There was no broken glass on the original film. Findings: Participants who were asked how fast the cars were going when they smashed were more likely to report seeing broken glass. Conclusion: This research suggests that memory is easily distorted by questioning technique and information acquired after the event can merge with original memory causing inaccurate recall or reconstructive memory. The results from experiment two suggest that this effect is not just due to a response-bias because leading questions actually altered the memory a participant had for the event. The addition of false details to a memory of an event is referred to as confabulation. This has important implications for the questions used in police interviews of eyewitnesses. One limitation of the research is that it lacked mundane realism / ecological validity. Participants viewed video clips rather than being present at a real life accident. As the video clip does not have the same emotional impact as witnessing a real-life accident the participants would be less likely to pay attention and less motivated to be accurate in their judgements. A study conducted by Yuille and Cutshall (1986) conflicts the findings of this study. They found that misleading information did not alter the memory of people who had witnessed a real armed robbery. This implies that misleading information may have a greater influence in the lab rather and that Loftus and Palmer's study may have lacked ecological validity. A further problem with the study was the use of students as participants. Students are not representative of the general population in a number of ways. Importantly they may be less experienced drivers and therefore less confident in their ability to estimate speeds. This may have influenced them to be more swayed by the verb in the question. A strength of the study is it's easy to replicate (i.e. copy). This is because the method was a laboratory experiment which followed a standardised procedure. Draw a table showing the results of experiment one and draw a bar chart to show the results of experiment two. Read the original article of the study. Conduct your own study repeating one of the experiments by Loftus and Palmer. Use photographs (or video clips) of car accidents and write a set of questions, one of which will be the critical question. Test one group of participants using the 'smashed' condition and the other group with the 'hit' condition. Calculate the mean, median and mode speed estimates for both the 'smashed' and 'hit' conditions. Illustrate your results in either a table or graph. Yuille, J. C., & Cutshall, J. L. (1986). A case study of eyewitness memory of a crime. Journal of Applied Psychology, 71(2), 291. Eyewitness testimony refers to an account given by people of an event they have witnessed. For example, they may be required to give a description of a robbery or a road accident someone has seen. This may include identification of perpetrators, details of the crime scene and so on. A leading question is a question that suggests what answer is desired or leads to the desired answer. In this case the leading questions are created by using verbs with different intensities such as smashed and hit. Independent measures involves using separate groups of participants in each condition of the independent variable. In this study 9 participants were randomly allocated to one of the 5 conditions, based on the verb used to ask the leading question: smashed, collided, bumped, hit, and contacted. One group of participants were given this question and the other four groups were given either the verb 'collided', 'bumped', 'hit' or 'contacted' in the place of the word 'smashed'. Participants' speed estimates were faster than reality. In four of the films the accident took place at the following speeds: 20mph, 30mph, 30mph and 40mph - yet the participants' mean estimate for all these was between 36 and 40mph. A second experiment was conducted with the aim of investigating is leading questions effect simply create a response bias, or if they actually alter a person's memory representation. Write an experimental hypothesis for experiment 1. Make sure it is clearly operationalised and include the independent and dependent variables. Why was it a good idea to ask 10 questions rather than just asking the critical question alone? Why was each group of participants shown the 7 video clips (of car accidents) in a different order? Outline the possible sampling technique that may have been used in this study. The participants knew they were taking part in a psychology experiment. How do you think this may have effected their behavior? Can you think of a way that this problem might of been overcome? Write an null hypothesis for experiment 2. Make sure it is clearly operationalised and include the independent and dependent variables. What is a 'control group', and why is it necessary? What is an 'experimental' group? Outline one difference between the responses given between the two experimental groups. Outline the quantitative measure used in this study.